Your Favorite Nightmare - Reach into the depths of your mind, you already know. Name: Reach into the depths of your mind, you already know. Venom Jade: Jade was once human, as most 'monsters' start out. Murdered by her fiance, she was chopped into pieces and left in the snow to be found by her master Jerimiah. Jerimiah brought her back to his lab to stitch her back together. Using many organs from dragons, wolves, felines, demons, angels and machine, he would slowly put her back together. With the ability to dissolve into a black mist filled with metal shavings, she kills her master and his son. With black veins that run along her left hand and arm, she devours the hearts and souls of those that stand in her way. Weight: Maybe 120, athletic but small frame. Eyes: Her iris similar to that of a camera lens. The iris a light gunmetal blue. 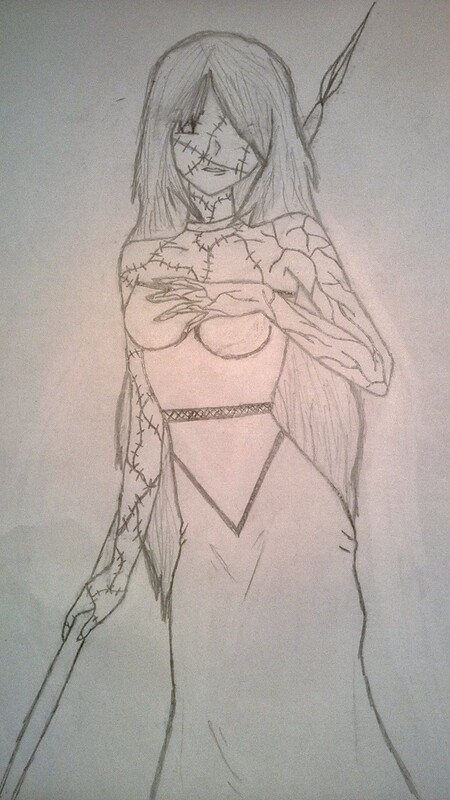 Crude stitching usually runs along her skin, the work of her master, but she contains the ability to hide the stitching to take on a more human appearance. Venom Jade. My main character. Will install bio soon. A lot of you already know me by several different names, but I've shed that skin and emerged something new. I had been on here a long time ago. yea that's me...well was. A lot has happened since that day. And not all of it was ever good. I'm sure none of you care to hear my pathetic story lol.